In Public Lab's spectrometry project, we've long used compact fluorescent lamps (CFLs) as a reference to wavelength calibrate our DIY spectrometers. This guide will show you how to do this in about 15 minutes. I believe that if your spectrometer is properly constructed, you should be able to get to about 1nm resolution -- complete the activity and post your results to help determine if this is true (read more here)! Basically, when you look at a graphed spectrum (as in the image above), you see a graphed series of intensities for each color along the spectrum, but the first time you do it, you won't see the wavelengths labelled in nanometers. This is because we just start out with an image from the webcam in the spectrometer, and don't know exactly which pixel of the image is at which frequency of light. Plug in your spectrometer. 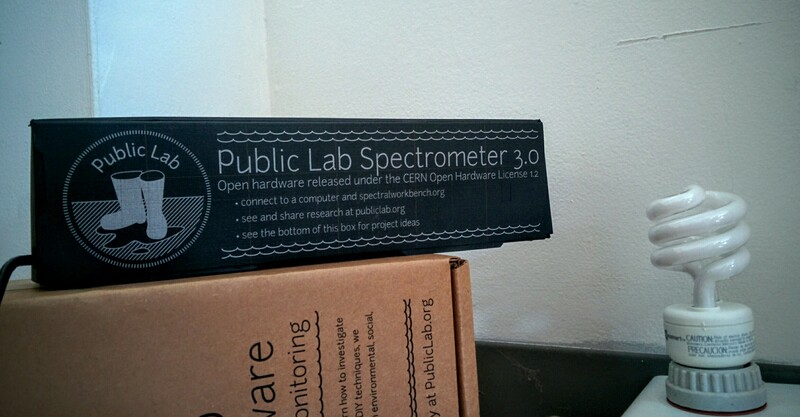 Log into Spectral Workbench with a PublicLab.org ID and navigate to the Capture interface at https://spectralworkbench.org/capture. Follow the prompts to connect to your webcam -- if it's running, you should see either a black image or some rainbow patterns from stray light. Don't choose a cross section yet, though! It'll be helpful to do this while pointing it at a CFL bulb. Find a CFL bulb -- the spiral type is pretty common, as shown below. Point your spectrometer at it, watching the Capture window to see when the rainbow of your CFL bulb spectrum appears as in the example. If you've built your spectrometer correctly, you should be able to select a cross section of the image that cuts right through the middle of the spectrum. This step can be tricky -- it's good to be within a foot of the bulb or you might miss it, but it can also be too bright, and your colored peaks will "blow out" and have flattened peaks. Then we won't be able to find the very top of the peak -- so if this happens, try shining the lamp closely onto a piece of white paper or on the wall, and pointing the spectrometer up against that. If this happens, checkout these tips for reducing exposure. 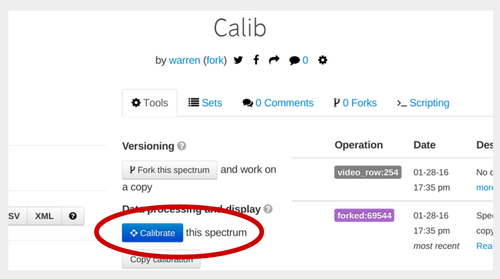 Once you have your CFL spectrum image saved, you'll see a blue button below marked "Calibrate" -- click it! As you can see in the above screenshot, you're presented with two sliders, and a reference spectrum, a pre-calibrated spectrum which is actually a version of @cfastie's "snowsky" CFL calibration, one I've used a lot as it's super sharp and has very low noise. When you click Calibrate, it will attempt to auto-calibrate or "guess" -- trying to automatically line up the two spectra. If it looks good, just click "Save." If not, drag the sliders yourself. The "Snap" checkbox will make the sliders "stick" to nearby peaks. Once you have a good match (the colored lines or "peaks" in the two spectra are lined up), click "Save." Your calibration will be shown as linearCalibration in the Operations table below. If you want to try again, be sure to delete the previous calibration -- and make a new one. Don't make two calibrations! Note: The system sometimes does not handle image reversal well. Sometimes horizontally flipped images can cause problems, so if it looks like the auto-calibration is opposite -- i.e. right to left instead of left to right. If this happens, you could try to "Set new cross-section" which will get fresh graph of data out of the image. We hope to solve reversal problems once and for all in an upcoming version. How good is your calibration? You may notice the green indicator that says "FIT" to the right. This is an attempt to compare the expected ratio of three known peaks to the peaks found in the image. Unfortunately, it has some shortcomings, and we'll probably be switching to a root-mean-square error approach, where we compare a much larger # of points to those of a known spectrum, after height-adjusting for the baseline and maximum peak height. We'll see if that works better, but for now, please be aware that the "FIT" indicator is not that reliable. It's good practice to calibrate at the beginning of each session of using your spectrometer, at a minimum. Some people may calibrate at the end too, to ensure it hasn't drifted during your tests. If you find that your calibration holds (by comparing a set of previous calibrations) you may not need to as often. But if you pack it up, travel with it, or modify it, you should definitely re-calibrate to be sure. If you change the cross-section line (in the steps on the Capture page) and your spectrum is not perfectly straight, a different cross section could move your spectrum left or right, and ruin your calibration. Be sure you're using the same cross section! What now? Once you've calibrated a single spectrum, you'll be able to apply that calibration to all of the spectra you've collected with that instrument (as long as you don't change anything, like the cross section). Since both images are the same size, Spectral Workbench will copy over the wavelength position of each pixel from the calibration image to the new image, and your spectrum will then be calibrated. Try it out and leave a response here, whether you need help, or if you've successfully gotten your spectrometer calibrated! And link to your spectrum so we can see how you did. And if you see a way I could improve this guide, please leave a comment! I'm also looking for a better photo of a Desktop Spectrometry Starter Kit pointed at a CFL bulb, so if you have one please help me improve this post! Hi Warren, let me introduce myself. My name is jurist, im freshmen of physics engineering student in University of Gadjah Mada. Currently, im taking optic class. Which my lecturer asked me to build a pinhole camera. To increase the camera resolving power, i need to select the best wavelength, however, due to spectrometer's cost, my lecturer advised to build one. Then, i was introduced to this website. Things went good until i started to upload a picture, it wont calibrate and wont squeezed the image as usual. I am confused with most spectra which they have black background with a spectra lies in the middle which is easier to analyze by spectralworkbench. To be noted, whenever i edit a picture such as attempting to crop or tilt picture, it wont calibrate. how am i supposed to do? Last, i would ask you what is the unit for the intensity in SB? Because it is only serve in percentage without any standard unit. Mostly, a percentage were meant to comparing two things like "object A is a half (50%) from object B"
I tried to calibrate your spectrum but Spectral Workbench would not complete the task. I don't know why it did not work. The intensity scale of a spectrum is relative because there is no easy way to calibrate the brightness of different colors from a photographic image. I am now able to measure my spectra using iPhone, i dont know why using mobile device is way more effective than PC. Also, how do you callibrate the intensity? My idea was finding the correction factor by dividing the data i got from spectraworkbench with the intensity value from Planck's Black body radiation (Since i use CFL, the manufacturer put its specifications including its CCT). Hi, there are some steps for intensity calibration outlined in #exposure-calibration, but they're not that easy to follow -- we would love if you'd share any work you do to document and make that process easier. Thanks! I'm sorry - the tag should be #gain-control -- and although I don't have time myself at this point to do a live chat, you could perhaps ask on the spectrometry discussion list and there are lots of people who've used these tools there. Or perhaps if enough people are interested we could do an open call.